It was an interesting ride to Pai from Chiang Mai. The five hour journey into the mountains contains no more than 762 bends with steep inclines and declines thrown in for good measure. This would have been good fun on a scooter but sadly we had opted for a minibus. The driving style of Asians has been a regular feature in our posts and as in Laos and Cambodia the locals here seem to be content with rattling along this hazardous road with little to no concern for the fifteen passengers crammed into the back. Overtaking three vehicles on a blind turn is their bread and butter. This is quite annoying when you are intending to make it to your final destination and have no real desire to die in fireball of flying metal, luggage and livestock. However this route is exceptionally uncomfortable for another reason.........vomit. Motion sickness is the "Achilles Heel" of Thai people. It still baffles me that people who learn to ride a scooter at the age of seven and drive at top gear on congested roads at the age of seven and a half (no exaggeration here) cough up their guts as soon as they take a medium left turn in a van but its true. Despite this we made it to the popular village of Pai in one piece (stinking of sick and immensely thankful our bags were on a roof rack, but in one piece). In mid December the place is overrun with western tourists, backpackers and Thai holidaymakers and despite having no booking we found a cheap bungalow at a place called "Pai Park Bungalows" by the river. It's fair to say we arrived with high hopes. So many backpackers in Laos held the village and surrounding landscape in high regard, however our first impressions were a little different. Firstly the village is surrounded by a nice mountainous landscape but if you think its going to be on the same magnitude of splendor and awe as South Asia's karst landscapes you may be disappointed. Secondly the village itself is purely a tourist trap full of restaurants, cafes, hotels and hostels. If your looking for culture or history again look elsewhere because there isn't any. Really if your looking for a place to loose yourself, sit on your arse and watch the world fly by for a few days then you will enjoy Pai. Our initial plan was to hire scooters in Pai and complete three quarters of the Mae Hong Son Loop (links provided below) as we had such a good time o bikes in Laos. This shouldn't have presented problems as scooter hire is a big business in Pai, however the hire companies seemed pretty close to useless. In Laos we hired bike off a guy called Mr Ku and he provided us with an array of contact numbers, a detailed map, a list of guesthouses and would only allow people to hire bikes if they seemed competent controlling them. In Pai we checked three separate companies. None of which could provide a semi-automatic machine and were hazy with a plethora of details we considered to be important like "Who do e call if we have mechanical issues? ", "Can we hire the bikes without handing in our passports? ", etc. Although it was a tough call. We always work on the principle of "if they seem like they cant organize a piss up in a brewery its better leaving them alone". Another setback yes, but still not the end of the world and after a relaxed night, a few beers and the first pizza we've in months we looked around for other activities. Our chosen option turned out to be a real surprise. 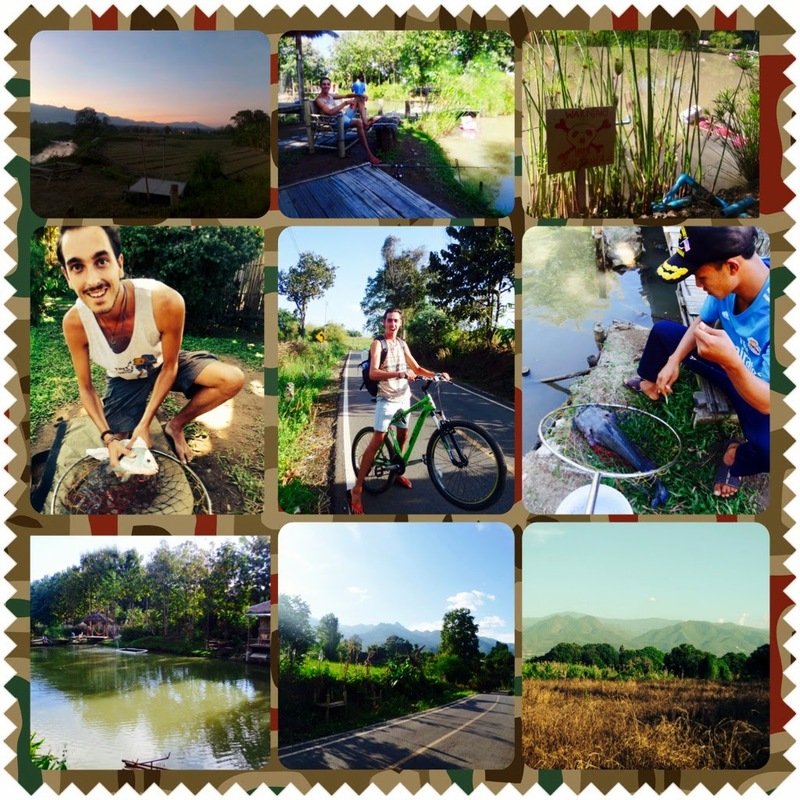 Bicycle hire to explore the surrounding area and an afternoon at a piranha fishery. The bike up to the fishery was hard going as its all uphill but well worth the effort and the view was incredible. Pai Piranha Park is a guesthouse on the edge of Pai with three small lakes stocked with an array of unusual fish (Piranha being one of them). At 100 baht (2 pound) for a half day fishing its a great way to spend the day if you enjoy the sport and they boast the best breakfast in town. I still regret not staying overnight. Ok so our stay in Pai didn't go to plan but it was a memorable experience all the same. Mostly due to another sickness incident on the return bus when a Thai guy threw up in some American guys rucksack. Never a dull day on the road. It was an uneventful one night return to Chiang Mai but necessary as we had a train to catch to Ayutthaya.